Limavady United striker Shane Jennings netted twice at the Showgrounds. Limavady United returned to Championship One football with a fully deserved win over H&W Welders. Paul Owens' side, who were missing six players from last season's title winning squad, had new signing Shane Jennings and substitute Jordan Thompson to thank for the three points. Jennings returning the Roesiders from Coleraine marked his debut with a first half brace, while his replacement at the break Thompson finished off a fantastic move, to cancel out any hopes the ten men had after Craig Harris had pulled one back on the hour mark. The Roesiders, who were rocked late this week with the news that striker Robbie Hume decided to leave the club and join neighbours Institute, should have fallen a goal behind after just three minutes. Welders experienced striker Davy Rainey got in behind the United defence, but the former Crusaders man saw his left footed strike from 10 yards well kept out by keeper Paul Wells. That missed chance came back to haunt the Belfast men as the home side took the lead on 10 minutes as Jennings was quickest to reaction as the ball dropped on the edge of the box, he made no mistake firing low into the bottom left hand corner past Welders keeper Jason Craughwell. 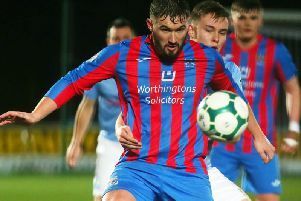 Welders were reduced to ten men on 32 minutes as Gareth McKeown was shown a straight red card by referee Declan Hassan after challenging Jennings. Just before the break United doubled their advantage as player manager Owens looked up to play in Jennings and he showed super composure, slotting the ball past an out-rushing Craughwell. Unfortunately for Limavady, Jennings picked up a knock in the first half and had to be replaced by Thompson at the break, but his replacement slotted in perfectly. Early in the second half Thompson saw his close range glancing header, which had Craughwell beaten, flash just wide. It was game on just after the hour mark as the visitors pulled a goal back when a well worked free-kick ended with Harris' stinging drive fizz into the net past a flat footed Wells. To their credit United didn't panic and they restored their two goal advantage on 71 minutes when a flowing move ended with Lee Harkin's cut-back finding Thompson inside the box, the substitute took a touch before side footing home from close range. Ten minutes from time Welders should have pulled another goal back, but Ross Arthur blazed over, after he chested the ball down just outside the six yard box. The final note worthy chance came on 83 minutes this time Wells had to make a smart save to keep out Arthur's stinging drive. Limavady United: Wells, O'Kane, Devlin, Watt, McKeever; Harkin, Gillen, McCloskey, Law (Logue 73); Owens (Mullan 85), Jennings (Thompson HT). H&W Welders: Craughwell, McKeown, Armstrong, McMullan, McMurray, Harris, Deans, Bonnes, Arthur, Graham, Rainey.